Melodic rockers from Finland get seriously (solar) powered on fourth studio album, set for release via Spinefarm Records on March 24th. Featuring 12 new pieces of music, including lead track ‘Taste Of A Champion’ plus follow-up single / video ‘Indelible Heroes’, due out next month, ‘Sunbound’ has been mixed by Finnish studio-meister Mikko Karmila (Nightwish, Children Of Bodom,Stratovarius), and is the follow-up to 2014’s ‘Diamond In The Firepit’. Since first coming together for their ‘False Metal’ debut back in 2006, Brother Firetribe have flown the flag for a brand of music (‘ultra-melodic West Coast AOR’) that once strode the US radio airwaves like a colossus, filling up arenas and providing the silky soundtrack to pool-side summers and wind-in-the-hair coastal highway drives; music pioneered by some of rock music’s most legendary names. 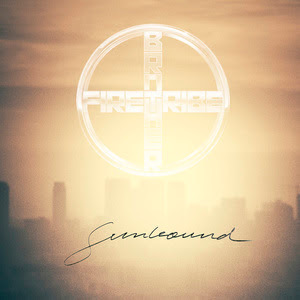 However, Brother Firetribe – that’s vocalist Pekka Ansio Heino, keyboard player Tomppa Nikulainen, bassist Jason Flinck, drummer Hannes Pirila, plus Vuorinen himself – are not trying to hitch a DeLorean ride into the past; rather, their collective aim is to both celebrate and reinvigorate a musical style that is all about big hooks, strong melodies, soaring vocals and searing guitars, not to mention the desire to entertain on a grand an’ glorious scale. ‘Taste Of A Champion’ – recently used as the theme for a major Finnish advertising campaign – packs all of the above qualities into an epic three-and-a-half minutes of ‘Rocky’ soundtrack-style delight, setting the tone for an album that stands as the perfect antidote to long, lonely winter nights under the quilt. Expect Brother Firetribe to return to UK soil later this year, following on from their appearance at the Firefest event in Nottingham back in 2014.